The past few years has brought change to Mormonism. The one change receiving the most attention is seen when a leader admits some aspect of the Church isn’t true. The problem with their disingenuous attempt at transparency is the ever present habit of lying. Time and again, the Church has missed the opportunity to throw open wide the doors of total honesty, and walk the highway of holiness as in Isaiah 35:8. They’ve chosen instead to meander down the same path they’re most familiar with; twisted half truths. The number of talks and interviews they’ve given in the past few years is growing rather quickly so we thought it’d be a good idea to put them all in one place. The page will be a portal for quick references to the talks they’ve given telling us that some aspect of the Church isn’t true, and their acknowledgement that membership numbers are in a world of hurt. Pray with us won’t you? We’re praying that as people escape, they’ll turn to the real Jesus and come to a saving knowledge of Him! Also, be sure to check in soon for updates because who knows what they’ll be saying tomorrow?! LDS Church Historian and Recorder, Steven L. Snow, explained why the Church won’t advertise their publications of essays. You can get more info about the recorded interview from the link above. On June 23, 2016 Russell Nelson told a group of missions presidents the BoM isn’t a true picture of historical events. His actual quote is below. To read the article, or get more info about his talk, click on the link above. ‘the historical narrative the LDS Church has been teaching for decades is not true’. He also stated they’re mostly concerned with the older generation of Mormons which is bothersome, because now they’ve alienated both young, and old with all their lies. The following two recent talks given by the late apostle Russell Ballard, and current apostle Jeffrey Holland reveal the deep concern, if not panic, they’re facing when it comes to keeping members in their fold. The first talk was delivered to a group of CES Teachers who were attending a training seminar on February 26, 2016. 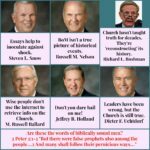 Russell Ballard said that wise people don’t use the internet to retrieve information about the Church. His words were nothing but a scare tactic trying to keep people in line when the availability of information is so easily accessible. The other talk by Jeffrey Holland was from the Tempe Rescue on April 26, 2016. In the audio you can hear the palpable fear in Mr. Holland’s voice as it rises to a near crescendo. His anger and frustration knowing that he’s losing control over the people is clearly obvious. More info is available at the link above. 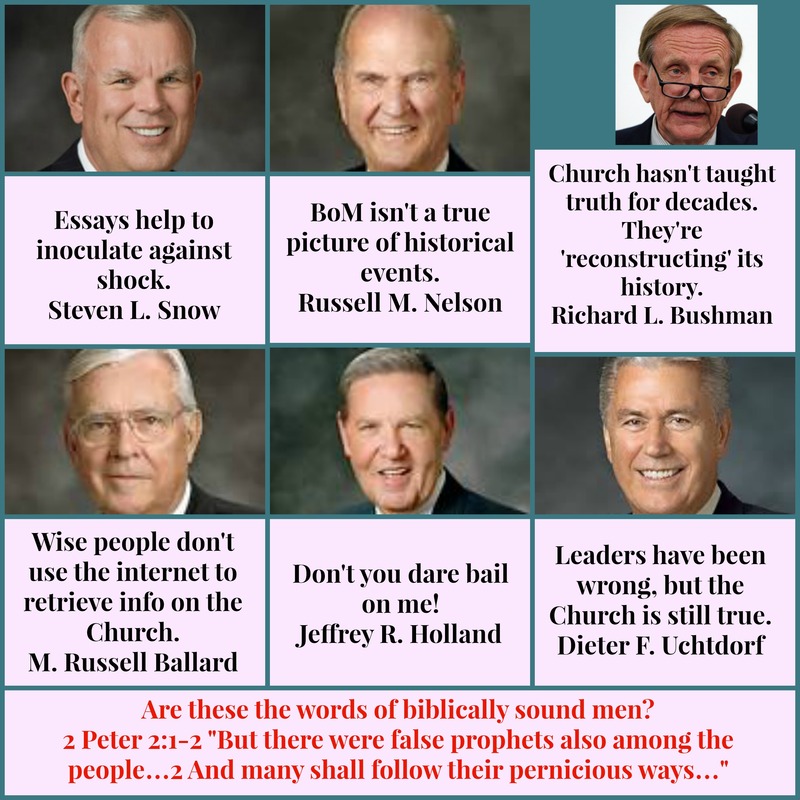 LDS Apostle Dieter Uchtdorf admitted at the October 2013 General Conference that even though the leaders might be wrong, the Church is not, and members should doubt their own doubts. To show such dedication to attemt to divert our church is kind of flattering… You must be afraid of something… afraid that we are right perhaps? I just want to let you know that there is always the process of repentants. Your sins will be forgiven so there is nothing to fear. Thank-you! Only afraid that more will be led astray.